If you're interested in spinning, weaving, felting, textile art, knitting, and more, this is the place to be! With suppliers, makers, demos & workshops, it will be a celebration of all things textile. 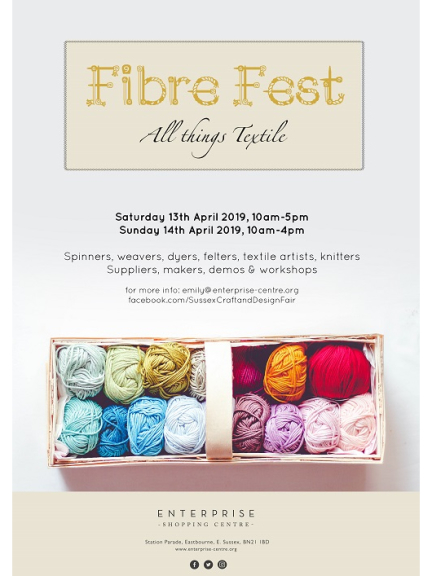 Fibre Fest – All things textile returns to the Enterprise Shopping Centre on the 13th & 14th April. With over 25 suppliers, makers, workshops and demos, it will be a celebration of all things textile. Exhibitors include Eastbourne based textile artist Gillian Bates who produces contemporary embroideries of local seaside scenes and Romney Marsh Wools. There will also be a collection of woven pieces by renowned artist, Tadek Beutlich. If you’ve ever wanted to try your hand at Weaving, Macramé, English Paper Piecing or Needle Felting then why not sign up to a workshop with experts Jackie Bennett, Suesie Seedpod and Little Miss Sew ‘n’ Sew.